Consul General Akira Chiba, at his official residence in Los Angeles on Nov. 30, acknowledged Tak Nishi of Los Angeles as the recipient of the Order of the Rising Sun, Gold and Silver Rays for promoting friendship and mutual understanding between Japan and the U.S.
Nishi, a Nisei, was born in Los Angeles in 1936, and from 1941 resided in his parents’ hometown of Kaseda City, Kagoshima Prefecture, eventually returning to Los Angeles in 1956. He was drafted into the U.S. Air Force in 1959 and served until 1961, retiring with an honorable discharge. Thereafter he has worked as a gardener — continuing to the present day — and currently is still involved with various community organizations. 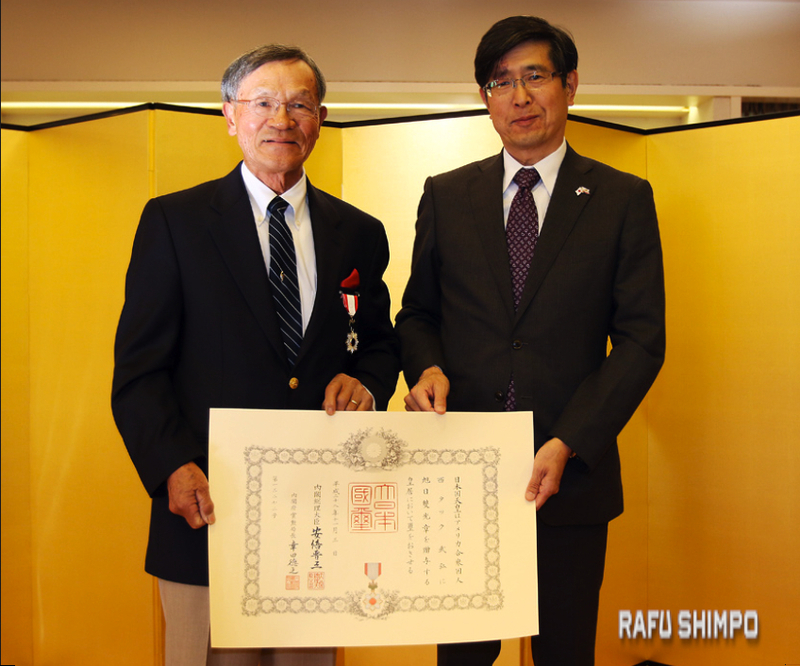 His volunteer work has contributed greatly to the development of Japanese language education and promotion of traditional Japanese culture. He has also greatly enhanced the well-being of the Japanese American community through his contributions in the music and entertainment field for over 50 years.